Spending time in nature is thought to offer benefits for your physical, mental and emotional health. 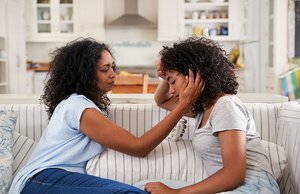 While many people enjoy escaping the hustle and bustle of daily life in a national park, mountain hike, wildlife safari or beach hideaway, they retreat back to civilization because the stress, uncertainty and dangers of camping are too much. 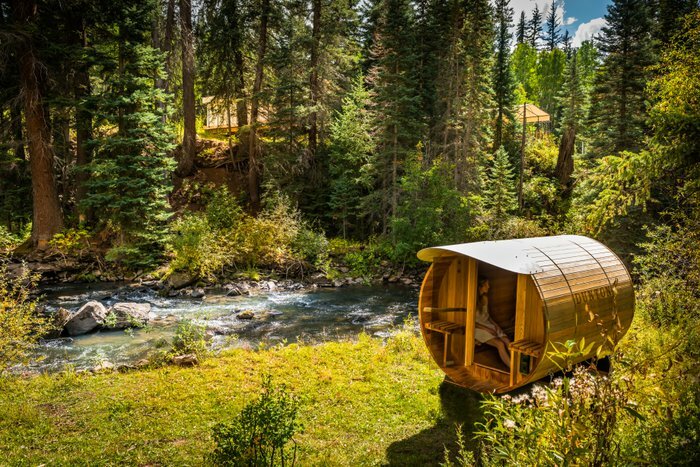 A modern solution to this problem has emerged, however, that lets you enjoy the benefits of immersion in nature without sacrificing modern comforts: glamping. 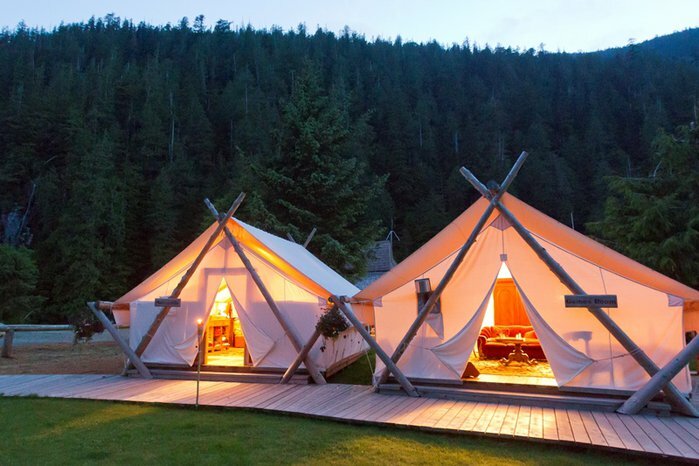 A portmanteau of "glamour" and "camping," glamping has all the amenities of the world's best luxury resorts and hotels combined with proximity to the calming sights and sounds of nature. 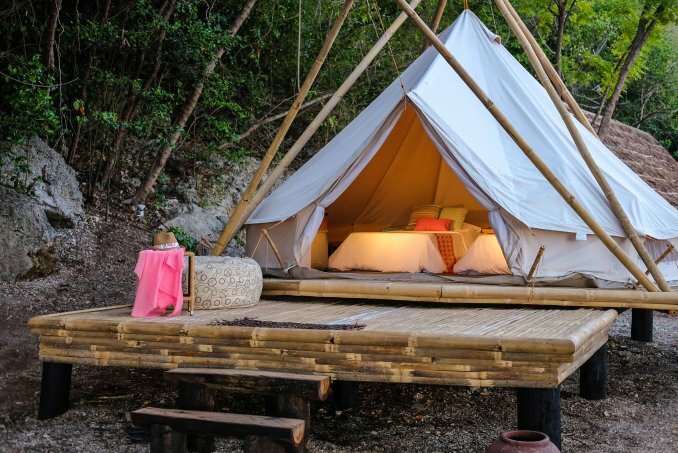 Glamping has become a trend around the world. 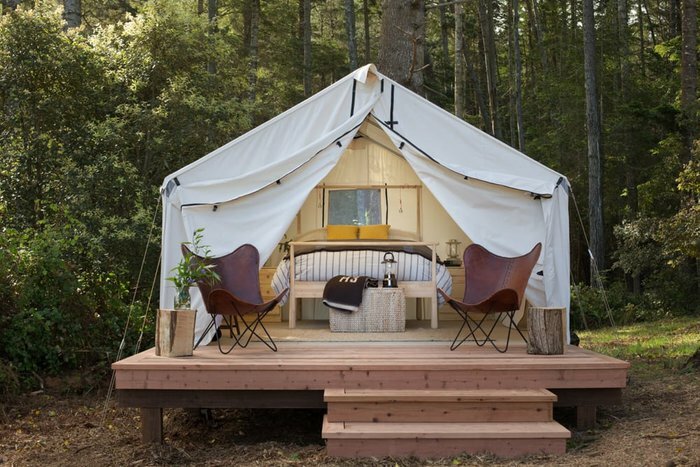 You can now glamp everywhere from Yellowstone to Indonesia. 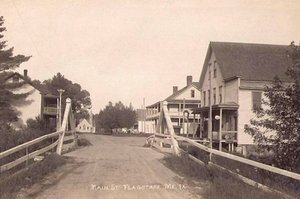 That's because glamping appeals to a variety of travelers. It offers seclusion for honeymooners, more green travel accommodations for eco-conscious travelers and a more intimate experience with local culture for those who want alternatives to touristy hubs. 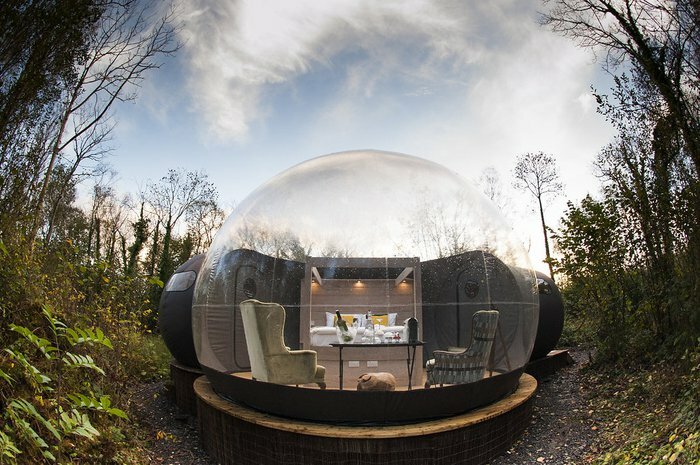 If you think glamping might appeal to you, read on to discover the glamping resorts around the world that offer both opulent creature comforts and amazing outdoor experiences. Sandy Pines offers a variety of unique glamping experiences including tents, an airstream trailer, a shepherd's hut, a glass dome and a glass house, all decorated with chic designs and plush furnishings. Also one of the country's best RV resorts, the campground includes amenities such as a heated saltwater pool and general store surrounded by a tranquil forest landscape. This luxury camp nestled in the Rocky Mountains has eight tent sites with ensuite bathrooms, gas stoves, laundry service and Wi-Fi. The riverside tents allow you to fall asleep to the sounds of rushing water, while the mountain tents provide privacy and stunning views. Spend the day hiking, mountain biking, fishing or horseback riding and then wind down by the campfire or in the riverside sauna, take a yoga class, enjoy a gourmet farm-to-table meal or relax with a spa treatment. 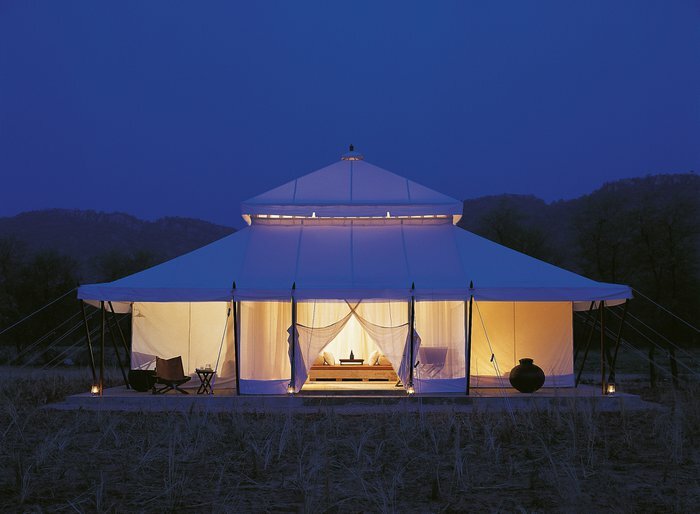 Glamping is a worldwide phenomenon. In Japan, you can experience the stunning beauty of Mount Fuji right outside your room's floor-to-ceiling windows. Situated on the slopes of a hill overlooking Lake Kawaguchi and the iconic mountain, Hoshinoya Fuji offers many areas from which to take in the natural surroundings, including private decks, patios, hammocks and a fire pit. The cabins themselves have air conditioning, ensuite bathrooms and comfortable furnishings. 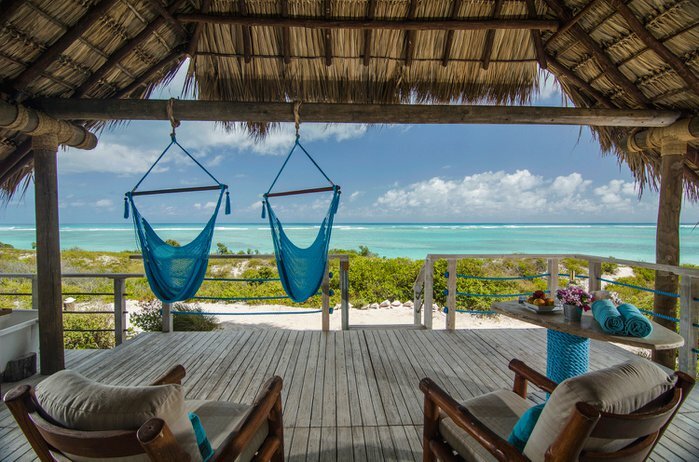 Wake up steps from the white sand beach in the British Virgin Islands in a waterfront tent at Anegada Beach Club. Soak in a tub or lounge in a hammock on a deck with ocean views and enjoy other amenities such as an ensuite bathroom, Wi-Fi and a king canopy bed. Other services include kitesurfing classes, fishing excursions, beach volleyball, a pool and a restaurant serving fresh local seafood. The Muckross Woods of Northern Ireland are dotted with the whimsical Forest Domes of Finn Lough. These "cabins" have 180-degree transparent walls, allowing for a truly immersive, magical nature experience while still enjoying the comfort of a plush bed and ensuite bathroom. The property also includes a spa, marina, docks for fishing and watersports, and hiking and biking trails. Marfa, Texas, is famous for its mysterious "ghost lights." 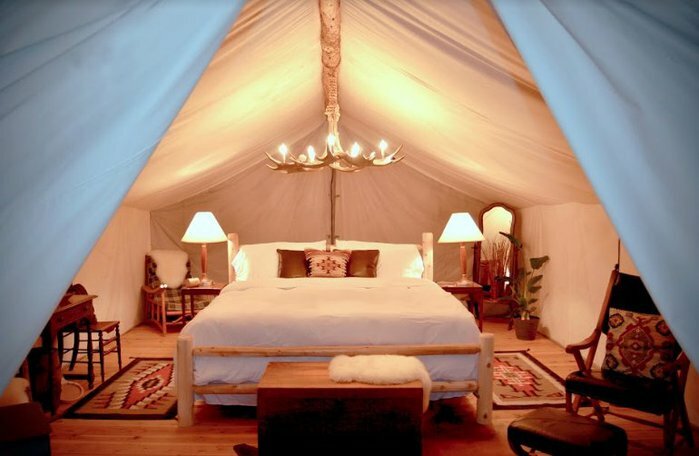 But for a glamping experience that's out of this world and as colorful as this quirky Texas town, check out El Cosmico. The property has trailers, yurts, teepees and tents with electricity, bath houses, a hammock grove, wood-fired hot tubs and an outdoor kitchen. El Cosmico also hosts creative events like cooking and art classes, songwriting workshops and more. 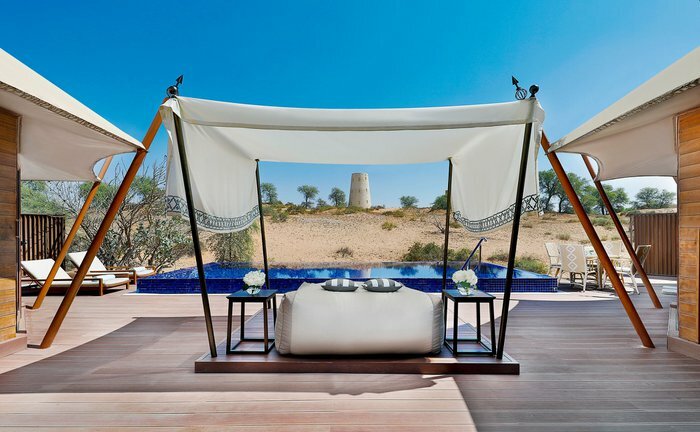 Though it's only 45 minutes outside Dubai, you'll feel like you're a world away staying at the desert oasis of Al Maha. 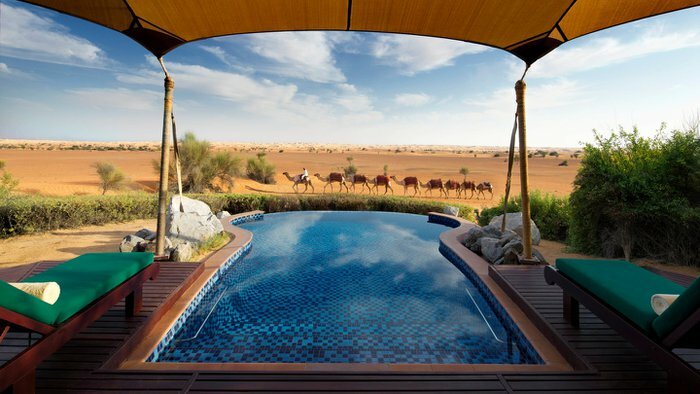 Located amid the sand dunes of the Dubai Desert Conservation Reserve, this hotel has Bedouin-inspired suites with Arabian furnishings, private decks and pools, butler service and morning newspaper delivery. Experience traditional desert activities like camel rides and falconry or relax with modern pastimes like spa treatments and fine dining by torchlight. Surrounded by lush wilderness, Aman-i-Khas combines a luxury resort with proximity to once-in-a-lifetime wildlife safaris. Each tent is assigned a guide who will accompany them on jungle excursions to see endangered tigers, leopards and more in neighboring Ranthambore National Park. Nightly dinners are prepared with ingredients from the resort's organic garden. The campground also has a pool, fireplace and spa, while each tent has air conditioning, an ensuite bathroom with large soaking bathtub, a sun deck and Wi-Fi. 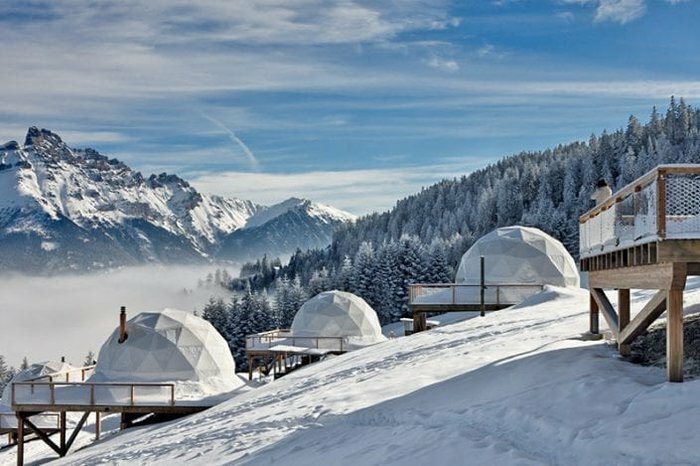 Enjoy the stunning mountain scenery of the Swiss Alps while being protected from the elements in comfort and style at Whitepod Eco-Luxury Hotel. 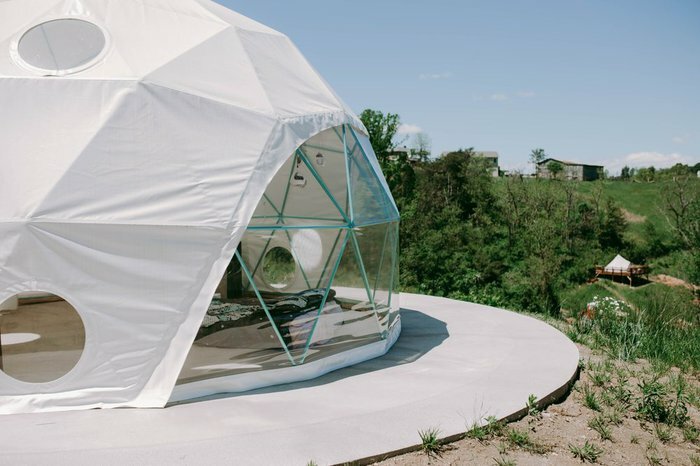 This hotel offers 18 heated geodesic domes with different amenities like ensuite bathrooms, minibars, terraces, private saunas and services like breakfast delivered every morning, massages, afternoon tea and guided activities. Less than an hour outside Marrakech but fully surrounded by the sprawling sand dunes of the Agafay Desert, Scarabeo Camp's Stone Desert hotel is truly a desert oasis. The camp comprises 15 tent suites with beds, writing desks, bathrooms, terraces and heat in the chillier months. 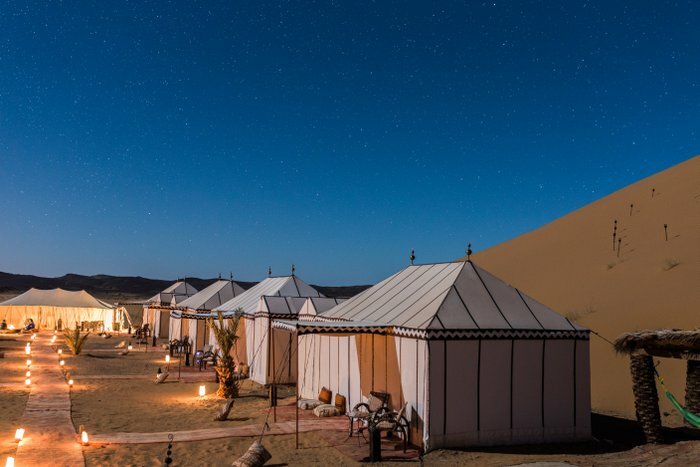 Enjoy traditional Moroccan cuisine in the open-air dining tent after a day of activities such as camel or dune buggy rides, yoga, massages, stargazing with an astronomy professor and more. 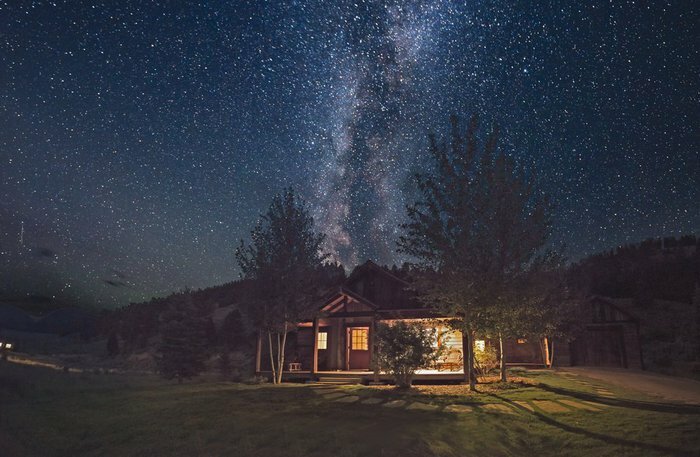 Plan a secluded retreat in one of the private cabins or canvas tents with ensuite bathrooms, gas stoves and private decks at The Ranch at Rock Creek in southwestern Montana. Enjoy proximity to nature as well as all the amenities of staying at a resort, including housekeeping services, a pool, a spa and twice-daily guided activities like fly fishing or cross-country skiing. 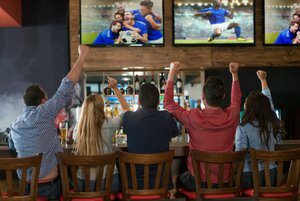 Grab a drink, play a round of bowling or catch a flick in the private movie theater at the Silver Dollar Saloon. 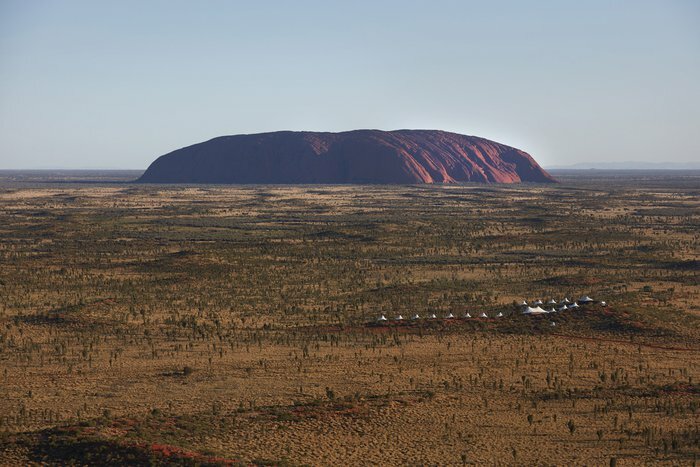 Longitude 131° is a five-star resort dropped in the middle of the outback of Northern Australia. Sitting in the shadow of Uluru (the monolith also known as Ayers Rock), each tented pavilion has premium amenities and a private deck and massive windows to let you take in the natural sights. The hotel also has a restaurant, bar, spa and custom experiences like dinner under the stars with Longitude's resident astronomer. You'll feel like desert royalty staying at these lavish, traditional Bedouin tents in the United Arab Emirates' Al Wadi Desert. The villas have Arabian decor, private pools and decks, and access to four restaurants and a spa. The resort hosts many activities to help guests explore the more than 1,000 acres of desert surroundings, including horse and camel rides, archery, stargazing, falconry and more. The Resort at Paws Up is located on a 37,000-acre working cattle ranch that you can explore and play in while still enjoying luxury creature comforts. The resort's tents have hardwood floors, ensuite bathrooms with heated floors, internet and cell phone service as well as a personal camp butler who can build a fire for you and a camp chef who will prepare breakfast and dinner. Wake up to the stunning sights and sounds of the Tatai River when staying in one of the 12 overwater tents at Cambodia's 4 Rivers Floating Lodge. Explore the river, visit waterfalls and hike in the Cardamom Mountains, then unwind in four-star accomodations that bob gently on the current of the Preat River just across from the Peam Krasaop Wildlife Sanctuary. Located on a truffle farm in the countryside of southern France, Pella Roca has just three cabins, so you'll truly get a secluded experience. Each cabin comes with its own private sauna, hot tub, fireplace and kitchenette. 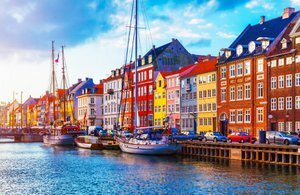 Enjoy outdoor pursuits like hiking, biking or kayaking or explore the nearby medieval village. A breakfast basket filled with local treats is discreetly delivered to your door each morning. You can truly get away from it all at Clayoquot Wilderness Resort, which is only accessible by seaplane, helicopter or boat. 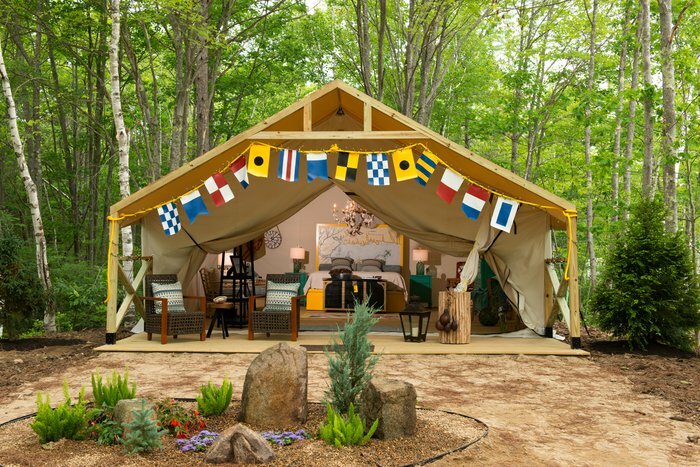 Waterfront tents come with high-end amenities such as ensuite bathrooms, private outdoor cedar showers and heated floors as well as rustic touches including vintage oil lamps and a cast-iron stove. 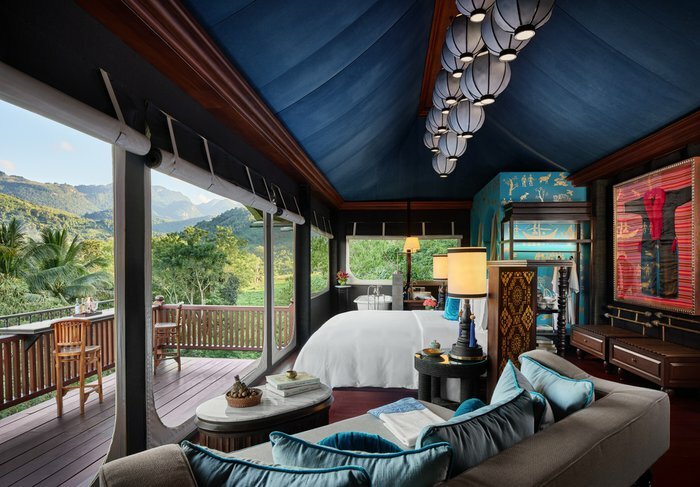 Experience the beauty and culture of Northern Thailand in style at the Four Seasons Tented Camp Golden Triangle. The hillside tents have breathtaking views, full bathrooms, private decks and safari-style decor. On-site activities include an outdoor spa, a private pool, guided jungle hikes and cooking classes in which guests forage for traditional herbs and spices. The camp also hosts a group of rescued elephants, and guests can arrange to join the gentle giants for activities and excursions. 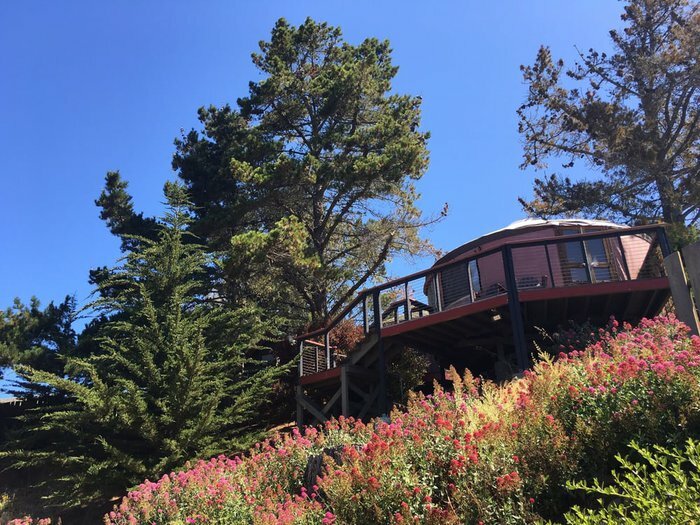 Take in the gorgeous scenery of the Pacific Coast from a yurt or a secluded, cocoon-shaped tent with private deck and fire pit at Treebones Resort in Big Sur, California. The resort's restaurant and sushi bar utilize fresh ingredients from the on-site organic garden. Between excursions into the gorgeous natural surroundings, guests can enjoy a massage, a yoga class or a dip in the pool or hot tub. 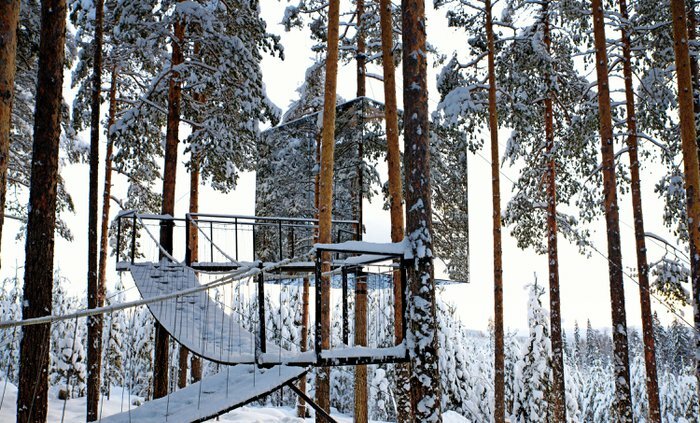 Located near the Arctic Circle, Treehotel uses the otherworldly, pristine landscape as the backdrop for cabins that also serve as architectural art. The pine forest separates the hotel's unique, individual "rooms," which are elevated 13 feet or more off the ground. Each has modern interior design, stunning views, ensuite bathrooms and Wi-Fi. The area is an ideal spot to watch the Northern lights, hike, bike, kayak or go on a wildlife safari. Nestled in the Mountain Pine Ridge Forest Reserve, Gaia Riverlodge has rustic, airy cabanas with stunning panoramic waterfall or mountain views. There's a full-service bar and restaurant on site, a spa, an organic garden and access to the surrounding tropical rainforest for tours and hikes. 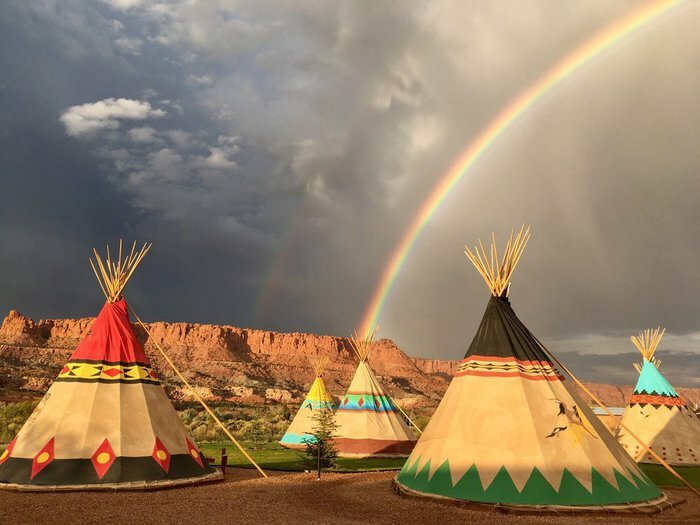 Feel like a Wild West trail blazer without having to rough it like a real pioneer when you stay in the tipis or Conestoga wagons available at Capitol Reef Resort in Utah. Enjoy star-speckled skis, red rock views and cozy campfires before retiring to your king-size bed, flat-screen TV and private bathroom. Other amenities include a heated pool, on-site restaurant and free Wi-Fi. The resort will also plan fun excursions like hiking with pack llamas. Northern California's Mendocino Grove sits on 37 acres overlooking the Pacific Ocean. 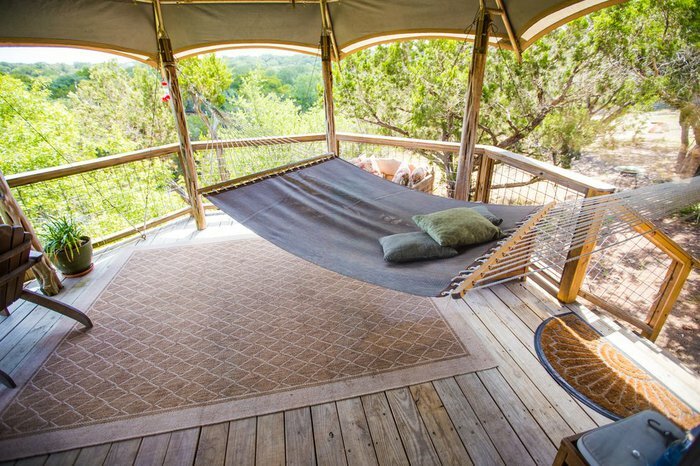 Campsites at this pet-friendly property include furnished safari-style tents with decks, outdoor tables and fire rings. Other amenities include a daily complimentary breakfast bar, gas grills and modern, clean bathrooms. Asheville, North Carolina, is a mecca for outdoor enthusiasts no matter the season thanks to the natural beauty of the Blue Ridge Mountains. Furnished tents and geodesic domes on the 15-acre property of Asheville Glamping combine rural relaxation amid rolling green hills with whimsical dwellings and creature comforts like hot tubs and Netflix. 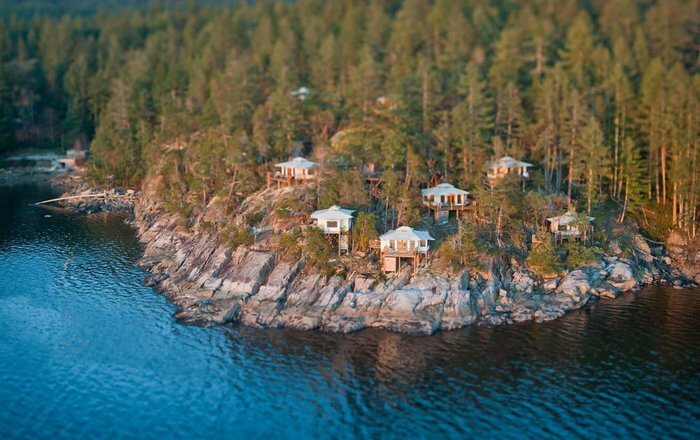 Located on Canada's Sunshine Coast, where the lush forest meets rugged coastal cliffs, Rockwater Secret Cove has glamping tents along Secret Cove equipped with heated floors, hydrotherapy bathtubs, fireplaces and private verandas from which to take in the coastal serenity. Watch the sunset over the water at the on-site restaurant or enjoy other amenities, including a heated swimming pool, spa, yoga classes and hiking and biking trails. 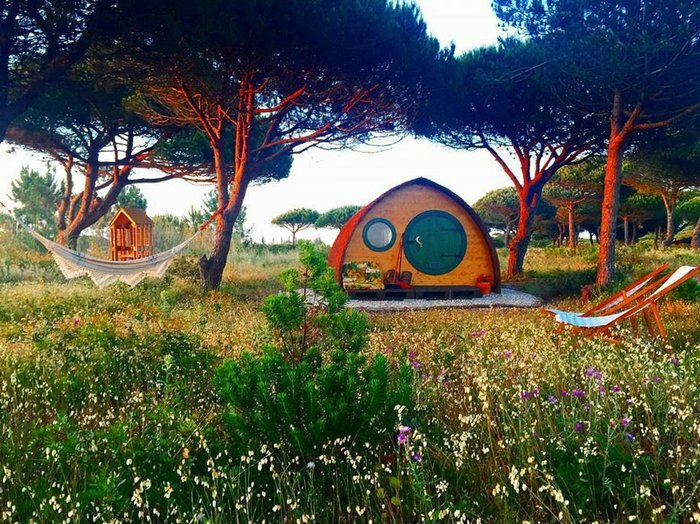 The cozy, eco-friendly wooden pods at Slowlife Glamping will add a touch of whimsy and fantasy to your glamping experience on a coastal farm on the edge of Portugal's Arrabida Natural Park. Just an hour from Lisbon, this site allows you to enjoy land and sea with ideal views of the sunset over the Atlantic Ocean. Have room service breakfast delivered or enjoy fresh ingredients from the garden. 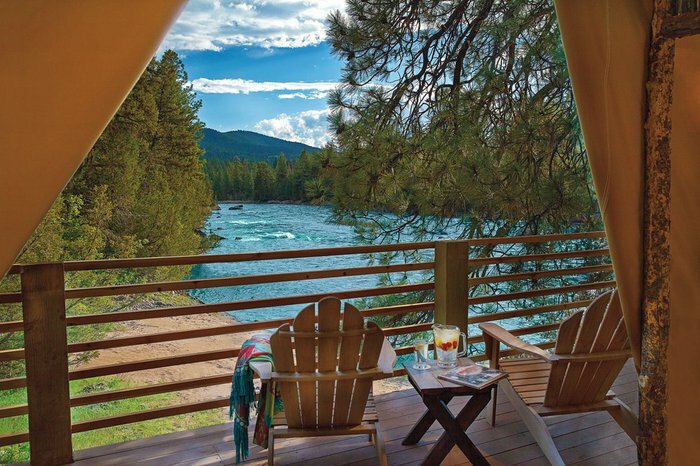 Enjoy fresh air, sunshine and air conditioning when staying in a luxury tipi at Sandy River Outdoor Adventures. 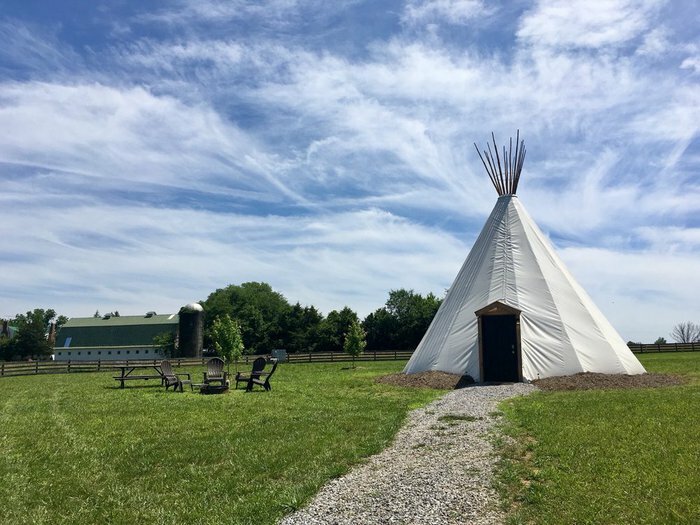 These tipis have heated floors, full bathrooms, kitchenettes, Wi-Fi, TV and more while still being located amid Virginia's natural scenery and the adventure activities of Sandy River Reservoir, High Bridge State Park and more. 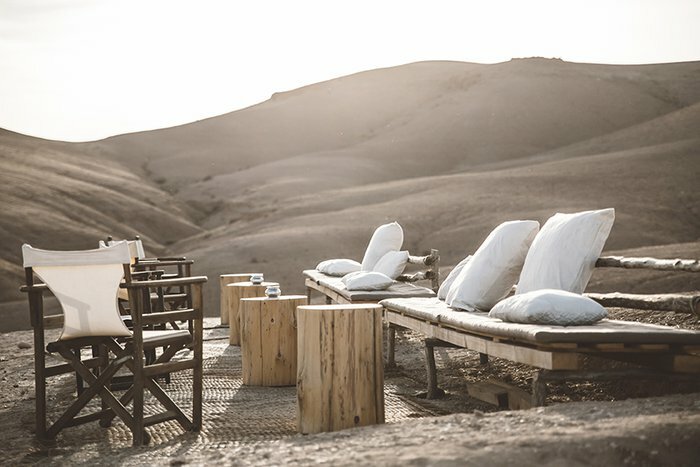 Desert dreams come true at this fantastical, lavish Moroccan camp amid miles of rolling sand dunes. White canvas tents floored with plush, colorful rugs provide a luxurious base camp that feels a world away from civilization. 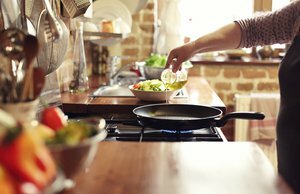 An on-site chef and kitchen will keep you well fed to fuel escapades such as sandboarding and camel trekking. Enjoy breathtaking sunrises, sunsets and night skies as well as after-dinner campfires and music. Sumilon Bluewater Island Resort offers more traditional rooms and villas as well as unique beach glamping accommodations. 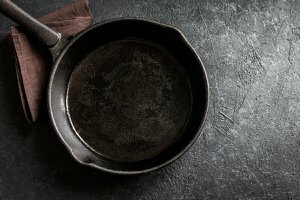 You'll learn how to "rough it" with activities like primitive cooking, knife care and fire making before returning to your tent with air conditioning, a deck and bathroom. The hilltop tents at Rosewood Luang Prabang offer the benefits of communing with nature but with the comfort of luxury accomodations. Enjoy an ensuite bathroom with bathtub and rain shower and a king-size bed facing your private balcony with gorgeous views of the surrounding forest, river and waterfall. 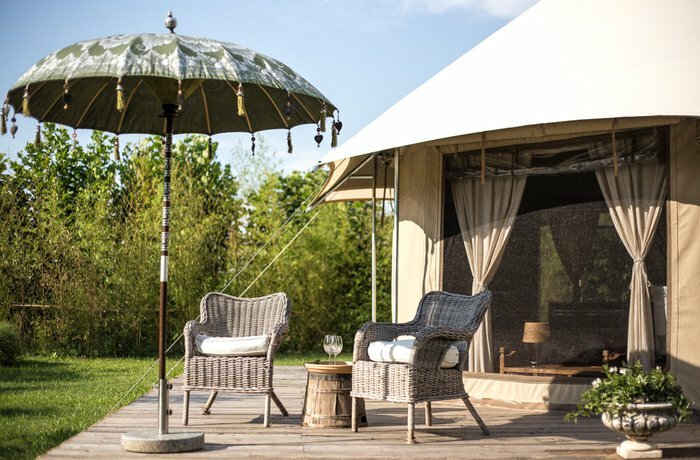 Enjoy the natural beauty of the Italian countryside without straying far from the cultural hub of Venice at Glamping Canonici di San Marco. The hotel's secluded tents overlook olive orchards, cornfields, gardens and a 17th-century barn. Rooms include air conditioning, ensuite bathrooms, housekeeping and more as well as special activities like wine tastings and romantic candlelit picnics. 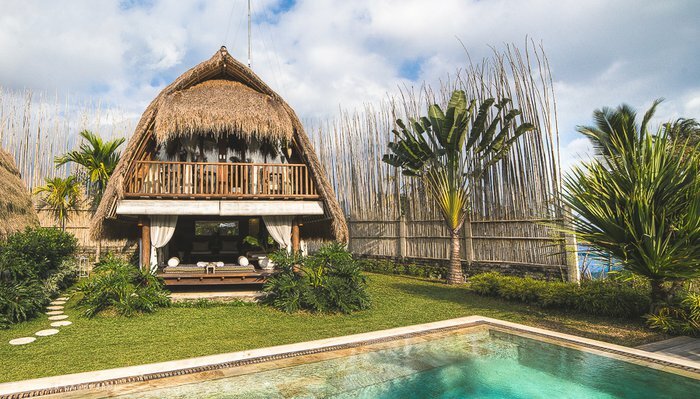 Tucked amid green terraced rice fields, Sandat Glamping Tents has five safari tent sites each with Balinese decor, air conditioning, a mini bar, ensuite bathroom and a private pool. Other services include a concierge, bar and restaurant, spa and yoga classes. For the perfect romantic couples retreat or peaceful family recharge, Sinya is a stylish, serene house tucked above a creek in Texas Hill Country, where you can play, swim and fish before returning to modern amenities like a clawfoot bathtub, hot tub, kitchenette, grill, hammock, patio and Wi-Fi. 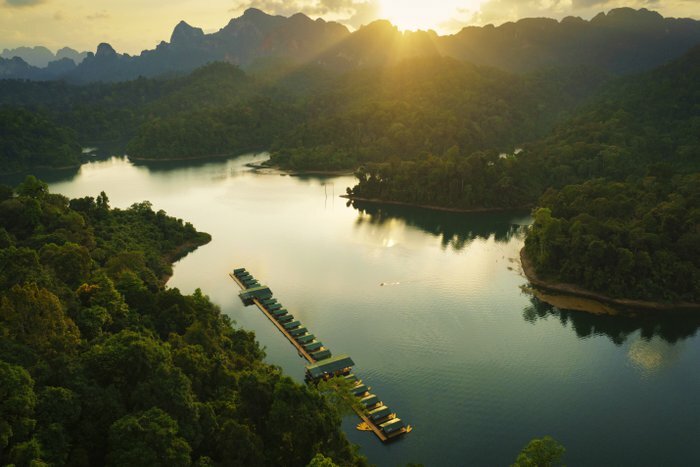 Elephant Hills Rainforest Camp allows you to stay in a waterside floating campsite on a lake in the rainforest with easy access to the elephant camp within Khao Sok National Park. You can ethically interact with these majestic creatures up close and personal as well as explore the natural beauty of Thailand's landscape. This wooded glamping resort goes beyond the traditional cabin with its lakeside treehouse. Built around two pine trees, this treehouse will make you feel connected with nature even while enjoying electricity, plumbing, a wrap-around deck and rustic furnishings. 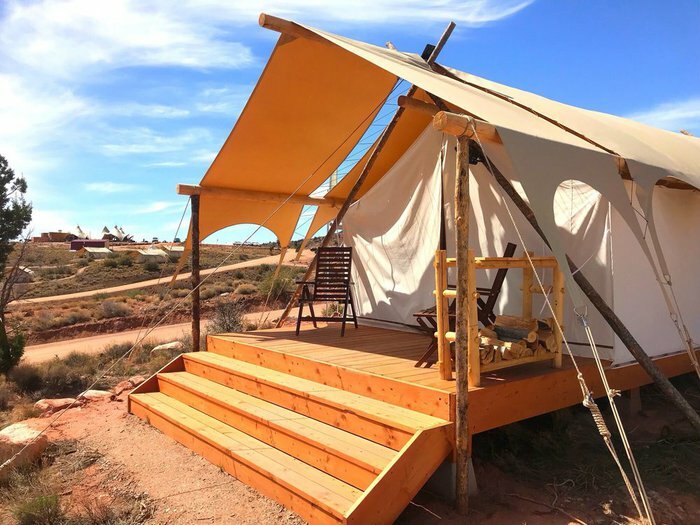 Under Canvas offers glamping at multiple American locations, including the Grand Canyon, Glacier National Park, Yellowstone National Park and Zion National Park. Under Canvas camps provide comfortable, secluded and furnished tents steps away from some of the country's most spectacular landscapes. Amenities include king-size beds, ensuite bathrooms, private decks and wood stoves. 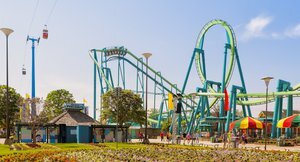 Each location offers different activities, tours and rentals to take the stress out of enjoying your surroundings with friends and family. 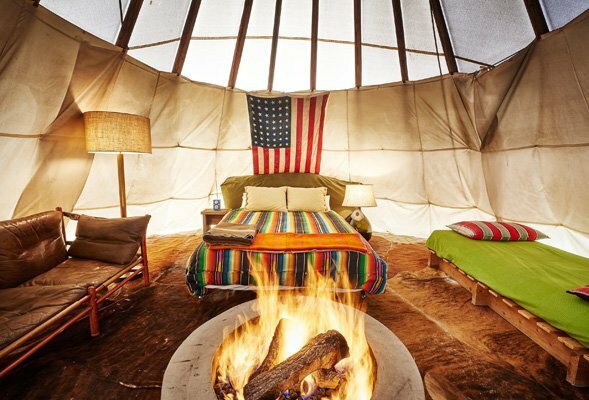 Collective Retreats has glamping sites at New York's Hudson Valley and Governor's Island, in the Texas Hill Country, in Vail, Colorado, and at Yellowstone National Park. Surrounded by sprawling natural landscapes, each location has rustic-feeling tents with electricity, private ensuite bathrooms, a wood-burning stove, a fire pit and complimentary breakfast so you'll be literally and physically recharged. Spending time in nature and away from your screen is just one of the ways you can live a more peaceful life.